Monday, April 22, 2019 from 9:30 – 11:00 a.m.
At the time of registration, each participant will draw a number designating the order of appearance and will receive an exact rehearsal time on April 22, 2019 with an accompanist. (For each applicant approximately 45 min. of rehearsal time are allotted). Monday, April 22, 2019 from 3.30 - 5.30 p.m. It is essential that each participant adhere exactly to his/her timetable! Be aware that there might be changes in the timetable due to unexpected cancellations. For updated, correct information please call the administrative office (Gabriele Korn) 0664/2302093! The participants have the opportunity to rehearse their competition program with the pianists. The jury deliberates and posts/announces results at approx. 7:00 p.m.
Friday, April 26, 2019: The whole day is free for competition participants! Rehearsal rooms are available for participants at the University of Music, Anton-von-Webern-Platz 1, 1030 Vienna, from 9:00 a.m. - 5:00 p.m.
Saturday, April 27, 2019: 3rd round/Finale 6:00 p.m.
10:30 a.m.-1.00 p.m.: Gläserner Saal/Wiener Musikverein, Bösendorferstrasse 12, 1010 Wien. General rehearsal for final participants. (Candidates have the opportunity to familiarize themselves with the acoustics of the auditorium). The jury breaks to decide on the winners, followed by the prize ceremony. The jury may interrupt during the 2nd piece. Please understand that this is no indication of the quality of the performance, it simply means that the jury has heard enough to judge your performance. 3 pieces: 1 art song, 2 arias. One of them has to be a piece from an Opera composed after 2000 ( for all participants who chose version 1 of the required repertoire) or a piece from an opera composed after 1970 ( for all participants who chose version 2 of the required repertoire). 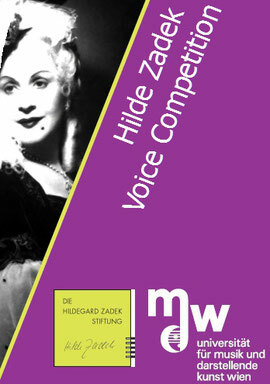 The pieces will be selected by the jury and will be announced the evening before the begin of the 2nd round. 4 pieces: 2 art songs, 2 arias. One of them has to be a piece from an Opera composed after 2000 ( for all participants who chose version 1 of the required repertoire) or a piece from an opera composed after 1970 ( for all participants who chose version 2 of the required repertoire). The pieces are selected by the jury and will be announced along with the results of the 2nd round. The participant may choose the order of performance. The jury may select a piece already performed during a previous round for the Finale.